VAC interviews Le-Cellier Restaurant. An official sponsor of the VAC! Get your palettes watering with some amazingly unique Euro/Asian fusion brought to you by Le-Cellier on Washington. The Venice Art Crawl interviews Hiep the co-owner of one of VAC official sponsors. Oh and did you know that they had a 50% off bottled wine every Thursday night for Ladies night! Get in the know. 1. How long has Le-Cellier been in business and what is the history behind it? 2 years since our grand opening on the 1st day of the Dagon on the lunar calendar, which explains our 40′ red dragon weaving through our ceiling. It was started by myself and Mark Van Gessel of the Hinano cafe as our collaborative effort to create a country club for the neighborhood that offers rare estate terror seven wine and a seasonal Menu. With my specialty, Franco-Vietnamese small bites and plates that became the cuisine of choice. Decode is a deconstructed vineyard. 2. What is it like being in such a central beach location? We are lucky in a location more for the community then for tourists. We are center the center of two dense communities, Venice and MDR and it is in our opinion, the future main Blvd of the Westside. 3. What makes your restaurant unique from the other restaurants around here? We are operating partners who handle select our rare estate driven wine and create our own Franco-Vietnamese dishes that follow the strong philosophies of the robust French cooking and fresh raw herbs in highly gluten-free Vietnamese dining experience. We offer rotating domestic French and domestic wines and an international selection of microbrewery beer. Our menu is seasonal, and even every sauce and dressing are created by us. We do special diet requests. 4. What would you say is your most popular dish and why? Our signature dishes are: 1) The Touraine Seafood soup where the French consume is home to wild Atlantic salmon, Mekong delta Basa white fish filet, and tiger shrimp swimming with celery, mushroom, tomatoes, onions, ginger, garlic (Twist a wedge of lime before you dig in!). 2) Shaken 5-spiced black peppered beef tender tails in port wine, onions, and tomatoes with watercress and jasmine rice. (Dip the beef in lime salt and pepper sauce on the side to get your digestion going!). 5. Do you offer a happy hour menu or any specials and/or events, is so when are the times? Our daily happy hours are until 7pm. Apps start at $4, beer $4, wine $6, champagne $5. We also offer wine tastings & wine flights every day and all day. Ladies night are on Thursdays. 6. We bet so many things happen in and around this area! What is a really memorable experience that some of the employees and customers at Le-Cellier were a part of? The pool of new creative young entrepreneurs appreciating Euro Asian cuisine and rare wine during regular socializing. 7. You guys are a great sponsor of The Venice Art Crawl. Have you always supported the exposure of local art? Art, music, food, and wine are the four directions of our soul. Come join us this Wednesday from 7-9pm at Le-Cellier for the VAC mixer. Come network, come mingle and lets get excited for the March 20th first Crawl of the year! Oh and did I mention they have Pho?! 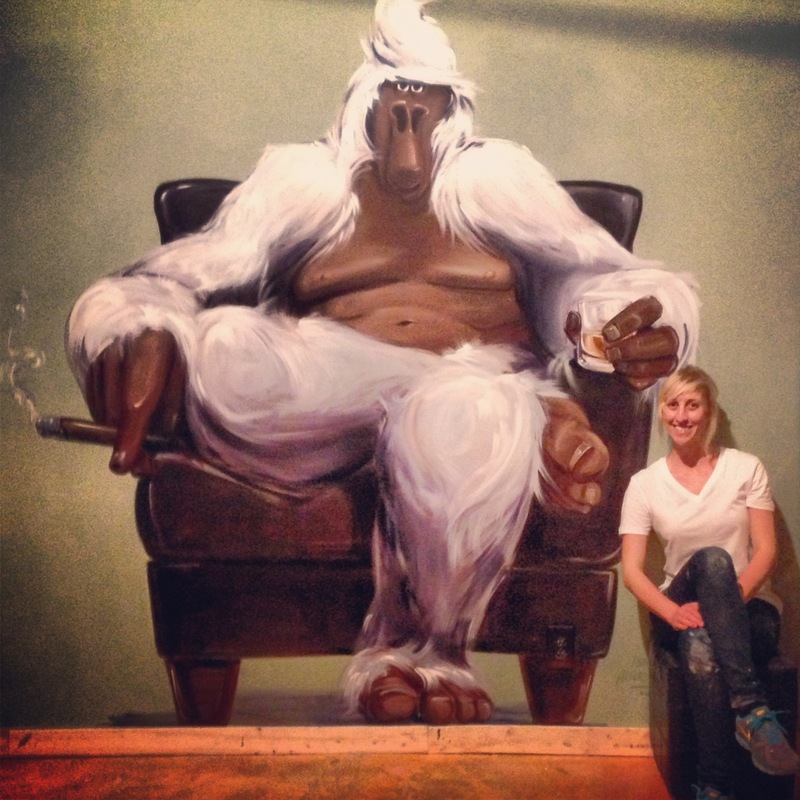 Check out our Venice Beach based artist interview of the week: Isabelle Alford-Lago! 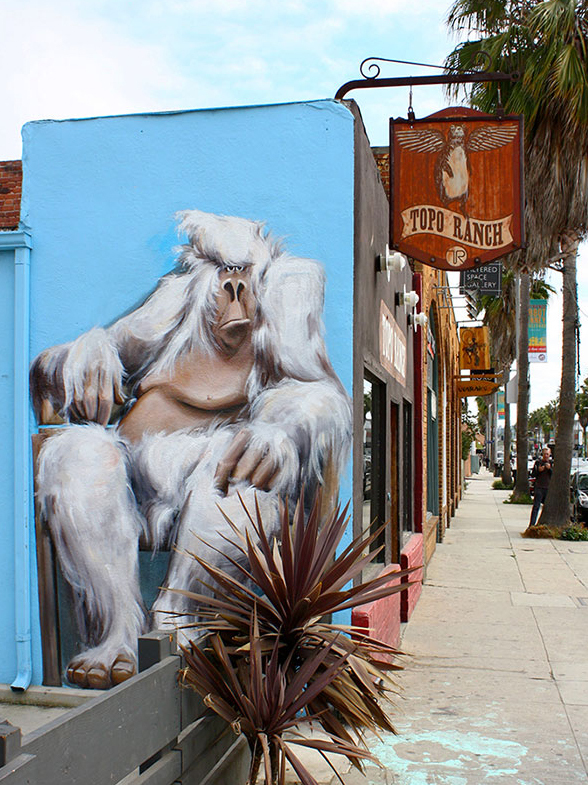 I paint large murals, which I started out putting up all over Venice and now have begun creating them in cities. For the past few years my subject matter has been big humanized gorillas that lounge around. They have a strong personality that people can recognize when they see them around. I also have a few t-shirt lines and print editions. 2. In your words how would you define art? It’s a way of communicating abstract thought, and gets you to let go of everything you think you KNOW about something. 3. At what age did you realize that you were creatively talented? Very young and my parents supported my talents too by putting me in more art classes when I was a kid. I grew up in Santa Cruz, a small beach town in Northern California. I have family from Louisiana and New Jersey. I came to LA to get my BA at University of Southern California and have lived in Venice since. 5. What materials/paints do you generally work with? 6. What art do you most identify with? I’m drawn to art that expresses personality and a good sense of humor. I admire artists who can reach a broad audience. 7. What is an artistic outlook on life? To look at the world with the curiosity of a child seeing something for the first time. And then make things. 8. What superpower would you have and why? The power to teleport, only because I really want to have access to the whole world. 9. If you could live anywhere in the world where would it be? 10. WHAT is your ‘method’? 11. What is your preferred subject and why? 12. What’s the best thing about being an artist? doing what you love and the ability to create something out of nothing. 13. What’s the worst thing about being an artist? 14. What advice do you have for aspiring artists? The key in my opinion is to be constantly creating and showing. It doesn’t just come, you gotta make it happen! Check out more of her work at isabellealfordlago.com!! Gabrielle Wooden is a writer currently residing in Southern California. Currently she is a blogger for the Venice Art Crawl and is working on her first novel entitled Blue Barcelona at UCLA’S Extension Writers Program. Venice Poetry meets Ceramic-Tile Art on Ocean Front Walk! As some of you may know, the Venice Beach Poet’s Monument was restored early January, installing 63 new visual poetry ceramic tiles at 17th street and Ocean Front Park. Take a sneak-peak Preview of The poetry fragments that are currently engraved on the 17th Street / Ocean Front Walk location! 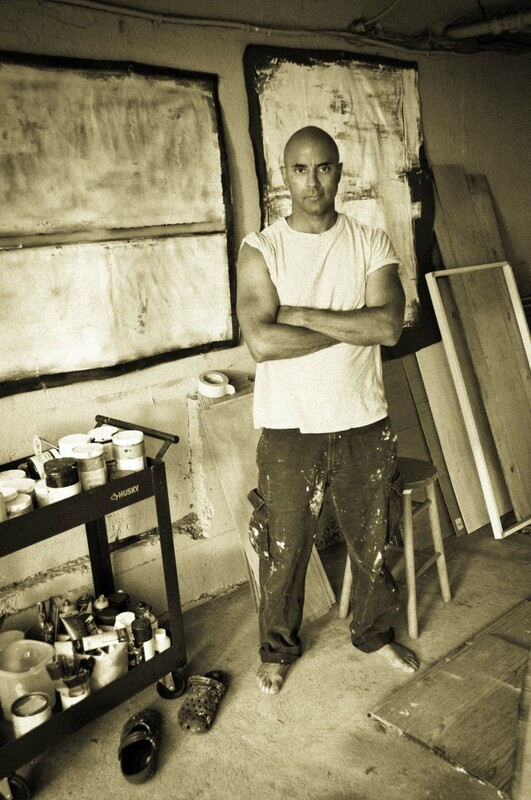 With the new month of February we introduce to you another Artist, Kevin Brewerton! This post is very special because it happens to be that Kevin is having an art show this weekend as well! (INFO) Get to know Kevin with the VAC and then hit up his show later this weekend! I am a visual, performing, and martial artist. I create art. I am an expressionist in all forms. Although I don’t usually like to put myself in a category, as I prefer to have the freedom to explore without a label. That being said I do find myself gravitating to Abstract Expressionism. 3. How did your relationship with art start? Growing up I never knew the value of art. I was raised to believe that art was ornately framed pictures that hung on the walls of those who were rich. Quite a beginning. As a teenager I didn’t like art. It confused me. I was much more interested in physical sports and dreaming about becoming a famous martial artist like Bruce Lee. Fortunately I was able to realize that goal by winning 5 world kickboxing championships. 4. At what age did you realize that you were creatively talented? That’s a tough question because at an early age I think that we just “do” without being conscious of what we are doing. But I can always remember sitting in class rooms in England, maybe 8th grade, doodling shapes and patterns on my work books. (I don’t think my teachers appreciated it) But I think I’ve always been sketching and drawing shapes. Perhaps it was an unconscious yearning to paint. I suppose that feeling kept growing. When I’d moved to London to pursue a career as a fighter, from time to time I’d find myself leaving the gym after working out and ending up wandering around the Tate Gallery in my sweat suit. I’d be mesmerized by Turner’s land and seascapes or I would find myself both offended and intrigued by art that I just couldn’t understand. Why would anyone pay so much money for that? I remember thinking, pointing at a plain blue canvas- I think it must have been an Yves Kline! Mostly acrylic and oil. However, I do like to experiment with different mediums. Tar is a very raw entity. I like the dense quality it brings. Any art that tells a story, Viscerally. I’m looking at art all of the time. Art that I can connect with. Art that is personal. Everything is art. Look around and it’s all art. The world is art. 7. Describe a real-life situation that inspired you? I’m fortunate to have had a lot of inspiring moments. However, one that particularly stands out was about 3 years ago when I received an e mail from a lady who was telling me that she and her husband had found my art. Her husband was also a painter, but had not painted in some years because he was virtually blind. She told me that they had studied a particular piece that I had painted, called, Unyielding, on their computer over and over. Because they were able to see the texture and thick brush strokes on the computer, the husband was able to see the art and and become inspired by it which led him to start painting again. They were writing to thank me. 8. What is your artistic outlook on life? I believe that art can change a persons life. I believe that art is the great mirror of humanity. I believe that art can be serious and intense, but also funny and ridiculous. 9. What superpower would you have and why? I’d like to be able to fly. I don’t like the traffic in LA. 10. If you could live anywhere in the world where would it be? I like where I live in Los Angeles. It has become one of the great art capitals of the world. But that doesn’t mean that you won’t find me in Berlin or Barcelona. I believe they are also great places to create art. 11. Name three artists you’d like to be compared to. I wouldn’t want to sound obnoxious by comparing myself to certain artists. But I will tell you who I admire and whose influence I hope shows up in my work from time to time. 1. Picasso – for his ingenuity and for thinking in a different way. 2. Franz Klein- for his raw abstract presence on canvas. 3. Milton Katselas for encouraging me to take risks and dare to be an artist. 12. WHAT is your ‘method’? My method is no method, anything that works! 13. What is your preferred subject and why? I don’t have a preferred subject, however I do find myself returning to the fighter, now and again. As a teenager I was formed through the kiln of a competition fighter- martial artist and boxing. Those themes keep showing up in my art in one way or another. 14. What’s the best thing about being an artist? leaving my mark in the world. Knowing that I can have a piece of art hanging in Hong Kong, Europe or a suburb in Pennsylvania. Knowing that I can be effecting someone at this very minute and making an impact on there lives. It gives me a sense of being timeless and universal. 15. What’s the worst thing about being an artist? Cleaning the oil paint of my hands. 16. What advice do you have for aspiring artists? Create. Don’t let anything stop you. There is no right way or wrong way. Art can be anything. Say what you want to say. Have a point of view. Check out more of Kevin’s artwork at his website http://kevinbrewerton.com !! Social Media Internship! The VAC is looking for Bloggers! The Venice Art Crawl is currently looking for Social Media Interns to help run the VAC blog! -Ideally be from Venice Beach/Santa Monica area. -Must have an interest in art, street art, and/or contemporary art. -Must be able to represent the VAC voice and brand. -Must have exceptional punctuation and grammar. If interested, please message our facebook!! Have a question? Want to get involved and volunteer? Please contact us at the email below. © 2019 veniceartcrawl.com. All Rights Reserved.